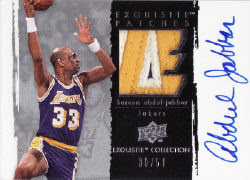 Voice of the Collector: 2009-10 Exquisite Collection Basketball Did Deliver -- But Was It Enough? 2009-10 Exquisite Collection Basketball Did Deliver -- But Was It Enough? The product is first class all the way. I always love the tins and this release promised to deliver at least two autographs in every box. That’s what we got. Each pack is supposed to be five cards but there was a sixth. So far this one has exceeded the base requirements but now lets see if we got our $650.00 worth . . .
Read the rest and see what else we pulled from Exquisite's swan song.